A Celebration And You’re Invited! Wild Game Dynasty December 20, 2016 Take A Hike! 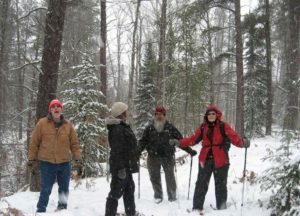 Celebrate National Winter Trails Day January 7th with Hiawatha Shore-to-Shore chapter (HSS) of the North Country Trail Association or on your own if you are adventurous. 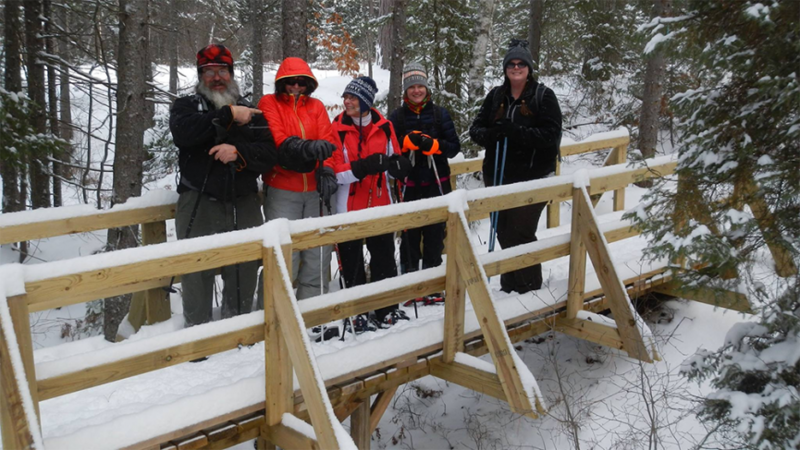 The celebration is designed to introduce the public to winter trail sport activities that are available to the EUP community and visitors all day long throughout the winter season. The event is planned so that participants can enjoy one or more of the event options from early AM to well after dark! Those wishing to begin their day early in the winter woods can ski the Hiawatha National Forest groomed cross country ski trails at the Sand Dunes parking area on Brevort Lake Road just north of US 2. The trails are rated from easy to difficult. This is a self-guided area with a plowed parking area. Interested skiers can contact the Hiawatha National Forest at 906-643-7900 or visit their website. This ski area provides a winter adventure seven days a week all skiing season long. The organized day begins at a “High Noon Brown Bag Lunch” around a bonfire at the North Country Trail crossing on Brevort Lake Road. 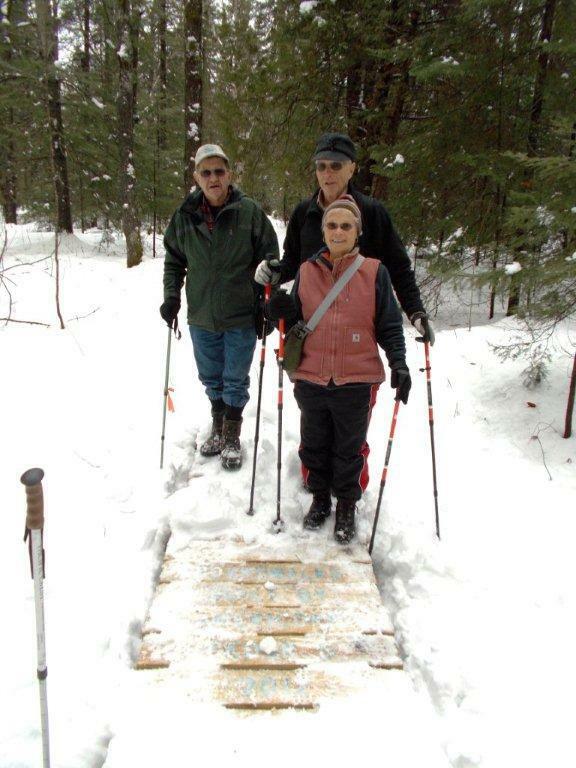 North Country Trail hikes on skis or snowshoes will be lead from the bonfire area until 3:00 PM. Hiawatha National Forest office on US-2 is hosting an Open House from 2:00 PM to 4:30 PM. They will be offering hot chocolate and healthy treats. Visitors can ski or snowshoe the Gros Cap Trail from the office parking area. This groomed trail is open seven days a week. USFS rangers are available to provide hiking information during office working hours Monday through Friday. This new trail offers a great view of Lake Huron and a lighthouse as well as a quiet stroll through the north woods. 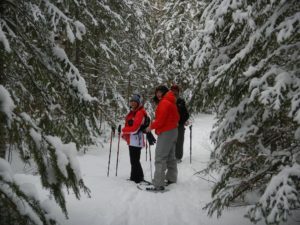 It is a great way for beginners to enjoy cross country skiing or snowshoeing. It also creates interest in the desire to explore more of the trails available in the area. The 82 miles of the North Country National Scenic Trail in Hiawatha National Forest is not groomed. 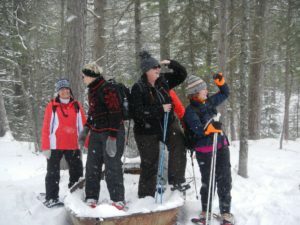 Bushwhacking on skis or snowshoes is a wonderful healthy leisure sport. It is a great experience to be the first person(s) to hit the “new” snow and create your own packed trail. You will soon become interested in fresh animal tracks. A multitude of photography opportunities abounds for those exploring the North Woods! Wonderful Facebook posts are around every bend in the NCT. At dusk the HSS chapter will “Stomp the Park” on snowshoes from Straits State Park parking area to enjoy the lighting of the Mackinac Bridge and a bonfire with s’mores and hot chocolate. A lantern lit trail will lead the revelers back to the parking area. Those arriving after dark can hike in on the lantern lit trail. This event is sponsored by Straits State Park and will be repeated February 4th and March 4th. This event is sponsored with the St. Ignace Events Committee. St. Ignace is a North Country Trail Town. For more information on Winter Trails Day visit saintignace.org or stignace.com. Call 800-970-8717 or 800-338-6660. HSS can be contacted at 989-350-2826 or northcountrytrail.org/hss . God’s health club awaits you!